their Speedos, snorkels and a pair of baby armbands for Dean Cox. 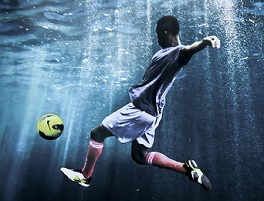 Still, of the two teams Orient adapted much better resulting in a first half so one-sided it resembled a swimming race between Michael Phelps and a lump of concrete. Yes, a two-goal lead was the least the home side deserved for some intoxicating attacking play from Cox, Odubajo, Lisbie and Mooney. Crewe – a decent side, make no mistake – came back hard in the second half but the Os bravely weathered the storm to record a fifth straight victory and leave them top of the League One table. Astonishing, really. Moment of magic… If there’s anyone you want to see grabbing the ball when Orient are awarded a penalty, it’s not David Mooney. Still, it’s a measure of the Irishman’s confidence this season that – after Kevin Lisbie stroked wide from the spot just minutes earlier – he stepped up to the plate and slotted home from 12 yards. Top Gun… Helpfully Orient PA Philip Othen announces the man of the match towards the end of each game these days, saving me the trouble of trying to figure it out for myself. 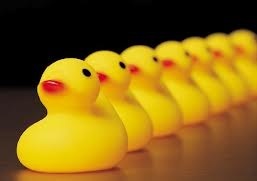 Today it was awarded to Moses Odubajo, which seems fair enough for a first half in which he repeatedly penetrated the Crewe defence like a German U-Boat attacking a flotilla of rubber ducks. I’d have given it to Jamie Jones though. Little donkey… No bad performances from anyone in an Orient shirt. Indeed, the team was on fire today – or at least it would have been if it wasn't under three feet of water. The management… “I’m getting a real buzz off the clean sheets,” said Russell Slade after the game, suggesting that the midweek nights alone in his Brisbane Road flat are pretty exciting on laundry day. But let’s take our hats off to a manager who pretty much everyone wanted sacked this time last year – Russell, we salute you. Tweet of the week... Only one candidate here: this photo by Os fan Adam Sampson from Stevenage last week, proving that there is food on offer at football grounds actually worse than the Labrador Pies and Scottish Border Collie Burgers available at Brisbane Road. Adam's tweet went viral - a similar reaction to that you'd expect from actually eating the cheesy chips - and made it into the national press. 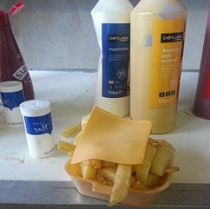 Stevenage FC denied the concoction was on sale at all in a dubious tweet full of dire cheese-based puns - demonstrating that when it comes to customer service, they don't give Edam. Sorry. Excellent stuff Matt, keep up the good work! I don't know, as I recall even some of Slade's biggest fans thought his number was up after the first few games of last season. Me included. Happy to be proved wrong though. Much better than the official match report a really good read. don't however agree that a lot of fans wanted Slade out at our level we have one of the best give him your support (plus some ££££s Barry)and Russell will deliver the results. Crewe fan here. A bit unfair to slate the Crewe view especially as the ref was poor. Took little account of the surface. You guys should have had a penalty before your first was given. An obvious trip. But then couldn't see any real pushing for one of the pens you were awarded. And what about our penalty shout in the second (just before we hit the bar) when one of your guys decided to play volleyball. Against a worse team we would have got a result but you guys looked very solid at the back. Can see why you don't concede. As for our fans, made a lot of noise which was good, but too many knobs in there who ended up trashing some of the seats. Good luck for the future. You'll need it with the West Ham stitch up. Cheers. Crewe looked like a decent side to me. I think their mistake was to try to play fast-flowing football along the ground in the first half regardless of the atrocious conditions. By the time they figured it out it was too late. Good luck for the season.